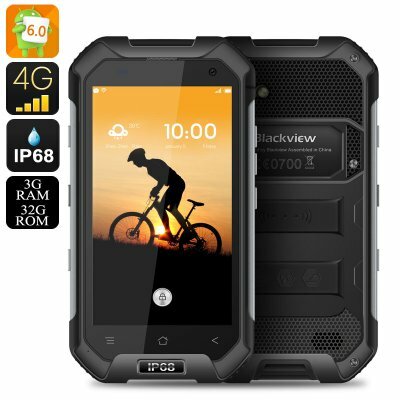 Successfully Added HK Warehouse Blackview BV6000 Android 7.0 Smartphone - 4G Dual SIM, 2Ghz Octa Core CPU, 3GB RAM, IP68 rating, NFC, SOS (Black) to your Shopping Cart. Blackview have released their latest rugged Smartphone which comes with Android 7.0, an Octa core CPU, 3GB or RAM and tones of exceptional outdoor credentials to take on your adventures. The main difference is that the all new BV6000 comes with and Android 7.0 marshmallow OS and of course comes with rugged credentials in the form of an IP68 waterproof and dust proof rating. This means it can withstand being submerged in up to 1 meter of water for 30 minutes. Boasting a Corning Gorilla Glass 3 screen and built around a metal frame means there's extra protection from any knocks or bumps and with its solid build and rubberized corners this phones more than capable of holding its own in the wettest and wildest of outdoor conditions. Rocking an MT6755 Octa Core CPU clocked at 2.0Ghz and with 3GB of RAM as well as a Mali-T860MP2 GPU the Blackview BV6000 has an outstanding performance making it one of the most powerful rugged phones on the market to date. more than capable of advance gaming, demanding multitasking and extreme movie viewing. Furthering its outdoor credentials this phone has an atmospheric pressure sensor helping yuou plot the changes in weather conditions so you are always informed of the weather to come. perfect for fishermen, hunters and outdoor adventures alike. Front and rear cameras let you snap photos at up to 18MP resolutions or record full HD video and there's plenty of storage available with 32GB of internal memory and 32GB micro SD card support, so you'll always have room to record the fun wherever you may be. With dual micro SIM card slots and 4G connectivity this powerful rugged cell phone is a real tough cookie. Built for the extremes it offers plenty of protection from everyday hazards and will stand up to the most rugged adventures. great for those working or traveling in harsh environments. The Blackview BV6000 also benefits from NFC, OTG and SOS support so you can master contactless payments, hook up more peripherals and make instant phone calls should the need arise. This Rugged IP68 Smartphone comes with a 12 months warranty, brought to you by the leader in electronic devices as well as wholesale Rugged Smartphones..
package came very fast, used dhl. came with extra port covers, screws, a screen protector, and a usb adapter. very solid and well made. very happy! i don't see on your site anywhere to buy more screen protectors. i'm sure i'll need more than one. I am really thankful to chinavasion for production such beautiful products. Blackview is one of the toughest smartphone ever i seen. My 4 year old kid says " Abbu now i can not break the phone, please change.. :) ". The delevary service and packaging was fantastic. It is same the photo, i liked this phone, high quality, nice design, unique. the packaging is very good. shipping and delivery takes only 2 days, fast shipping.